The Micronauts come together for the first time! Later, space pirate Oziron Rael, one of the last Pharoids, is unloading his latest cargo on Micropolis-12. His client's muscle make light of Saqqura's destruction, earning Oz's ire and leading to a fight between them and Oz's companion, the taciturn super-soldier Acroyear. Oz is thrown off a platform, but luckily, his other crewmate, Phenolo-Phi, is there to save him with her stolen Space Glider suit, and the crew are brought in to meet with Hezlee Ferro, their client. To Phen's chagrin, Hezlee docks their payment for causing the commotion outside, but offers them a new job opportunity: breaking into the Ministry of Science's Valtricos research space station, currently blockaded by the Ministry of Defense, to steal medical supplies. Oz agrees, and Hezlee assigns his personal security agent, Larissa to accompany them. Meanwhile, at the Ministry of Defense's outpost at the perimeter of the entropy cloud, Baron Karza listens to a status report from an MT class robot, before going on to discuss the ongoing civil war with the Ministry of Science with his wife, Shazraella. The spymaster questions her husband's leadership skills of late, prompting a warning from Karza that his intolerance for insults might yet outweigh his loyalty to her. At Valtricos research station, the Heliopolis uses its rare warpcore drive to materialize right next to the space station, giving Oz and his crew the element of surprise. The sarcastic first mate Microtron stays with the ship, whilst the other four "Micronauts" warp aboard the research station, but Phen's attempt to scout ahead reveals that the station is filled with military grade sentry-bots, which immediately attack them. 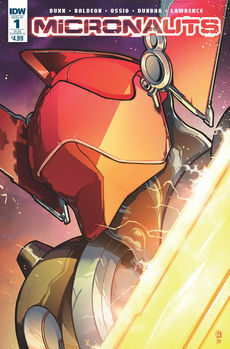 Their communications with Microtron now jammed, the Micronauts stand and fight, with Larissa revealing that she possesses unique force field technology. Whilst the bots are defeated, mostly thanks to Acroyear and his sword, they quickly begin enerchanging to rebuild themselves, prompting the Micronauts to flee through a blast door to buy time. They find themselves in a chamber storing a Biotron and several Phobos units, all containing long-dead pilots. Hoping that the Biotron can let them restore communications and pinpoint the supplies they came for, Oz throws out its dead pilot and climbs aboard himself. The Biotron brings communications back online, but Oz is shocked to learn from it that there are no medical supplies aboard the station, and that Valtricos was actually working on biological warfare. Suddenly, the Phobos units activate themselves, launching an attack that blows a hole in the side of the space station! "First of all, my people weren't pacifists. We just didn't believe in fighting a pointless war. Second of all, I'm not going to hit you... But he will." —Oz introduces Acroyear to Hezlee's hired help. "Why didn't you tell me you had force fields? I would have been a lot more confident—brash even—if I knew you had force fields!" —Oz likes Larissa's shiny toys. "Watch where you're deflecting those blasts, Acroyear! This glider suit wasn't cheap!" "I was under the impression, Phenolo-Phi... that you had stolen that suit." "What? Don't you appreciate sweat equity?" —Phen and Acroyear debate semantics. That line about the Entropy Cloud showing signs of intelligence? Yeah remember that for later. Micropolis-12 is named after the Micropolis playsets from the Micronauts toyline. The vessels in the Ministry of Defense's perimeter outpost include Mobile Exploration Labs and Satellite Survey Stations. Baron Karza's MT class robot uses the original Microtron toy's alternate 'devil head', in contrast to the 'our' Microtron who uses the toy's standard head. Regular cover: Baron Karza is magnified by lenses, by J.H. Williams III. Subscription cover A: Acroyear, by David Baldeón and David Garcia Cruz. Subscription cover B: Acroyear flies above a stag beetle, by Gabriel Rodriguez and Nelson Daniel. Subscription cover C: Photograph of the Baron Karza toy, by Jack Rivera. Subscription cover D: Blank cover for sketches. Retailer incentive cover A: Biotron and Acroyear, by Casey W. Coller and John-Paul Bove. Retailer incentive cover B: Biotron, by Butch Guice and Joana Lafuente. Retailer incentive cover C: Baron Karza, by Michael Golden. Complete 3D Box Set exclusive cover: Anaglyph 3D version of the regular cover, by J.H. Williams III. Forbidden Planet exclusive cover: Baron Karza and Acroyear battle atop a Forbidden Planet cash register, by Darick Robertson and Joana Lafuente. Hoknes Comics exclusive cover: Baron Karza action figure, by Adam Riches. Bell, Book and Comic exclusive cover: Baron Zarza holds Force Commander and Acroyear's heads, by STuart Sayger. RobLiefeldCreations.com exclusive cover: Acroyear and Baron Karza, by Rob Liefeld and Romulo Fajardo Jr..